Making a grilled cheese sandwich may seem easy as boiling water, but I’ve seen plenty of burnt ones, carbonized like Han Solo on the outside, with cold cheese in the middle. The key to grilling cheese is medium-low heat. It takes 5 minutes per side, but always results in a gorgeous golden crust and gooey warm cheese inside. The other key is to completely butter the bread all the way to the edges, to prevent dry spots. 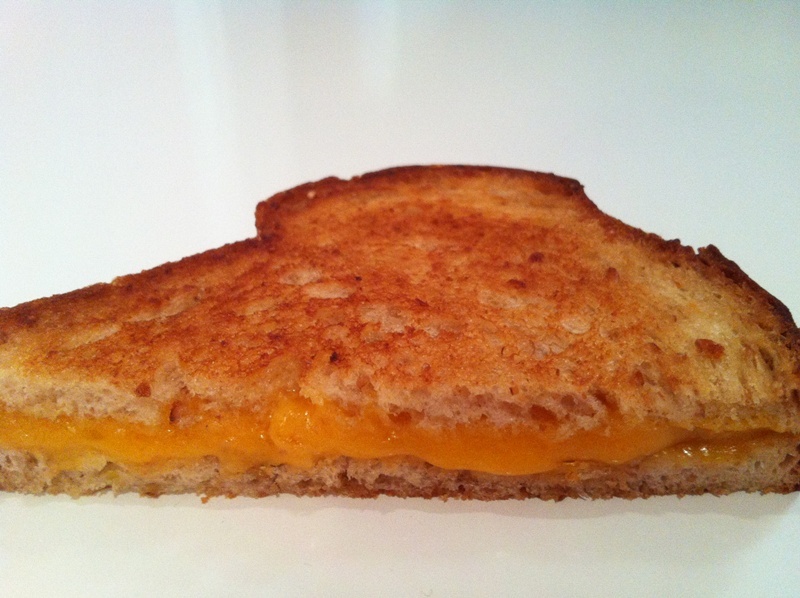 If you don’t have pre-sliced cheese, then shredding the cheese makes it easier to distribute on the bread. Some will fall in the pan, but at medium-low heat the cheese bits will turn deliciously crusty. My favorite is a double slice of Havarti, or a single of Cheddar, but any cheese will do. Preheat skillet on medium-low heat for 1 minute. Place a piece of bread, buttered-side down, in the skillet. Add slices of cheese on top. Yes the skillet is hot, but not dangerously so. Add condiments, if you wish, on top of cheese. I recommend Wickles Relish. Place other slice of bread, buttered-side up, on top. Let it cook for 5 minutes. You may wish to lift it with a spatula to check at the 4 minute mark, because not all pans and stoves are alike. Flip it with spatula, cook 4 to 5 minutes more. Maybe 6 if you like it that way. Of course, pair it with tomato soup. Campbell’s replaced sugar with high-fructose corn syrup in the now-inferior Tomato Soup, but Campbell’s Harvest Select Tomato with Basil is made with sugar and it’s delicious.